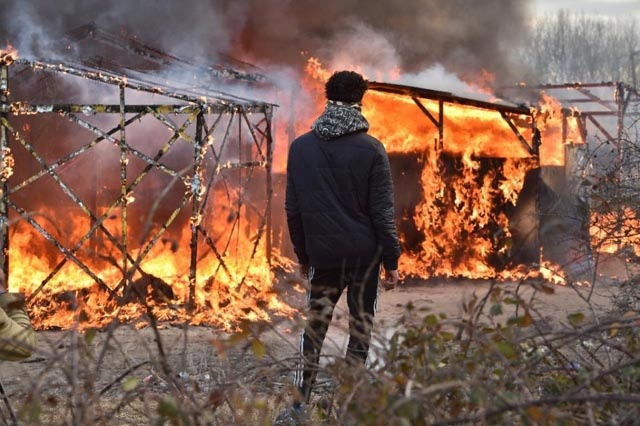 (AFP) - Clashes broke out between French riot police and migrants on Monday as authorities began destroying makeshift shelters in the grim shantytown on the edge of Calais known as the "Jungle". Police lobbed tear gas cannisters at migrants who protested as around 20 workers moved in to start pulling down the shacks by hand, initially under blue skies as an icy wind blew. As night fell some 150 migrants threw rocks and struck vehicles heading for England on a port road which runs next to the sprawling camp, staying there for an hour or so, some wielding iron bars, an AFP reporter said. Police responded with tear gas. Several trucks and cars were blocked by migrants on the stretch of road overlooking a piece of ground which had previously been part of the Jungle. Earlier, migrants and members of the British "No Borders" activist group, who launched projectiles at the police, set fire to about 20 shelters at the camp, as running clashes continued through the afternoon. By 1845 GMT police had back control of the port road, which remained strewn with debris. Three members of No Borders and one migrant were arrested, according to local government officials. The demolition of the southern half of the camp began after a court petition by charities to stop it was rejected last week. "It's infinitely sad to see the waste of so much work that we've done in the past months," said Maya Konforti of the Auberge des Migrants (Migrants' Hostel) charity. Volunteers and aid workers have spent months trying to improve conditions in the camp, built on a former toxic waste dump on the outskirts of Calais. But the migrants do not want to give up their hopes of Britain, which they try to reach daily by sneaking aboard lorries and ferries crossing the Channel. "These people want to reach Britain and won't leave. They will end up in even more hardship, particularly in winter," Konforti said. The Jungle has played into fraught discussions about Britain's possible exit from the European Union (EU). Some opponents of "Brexit" say that if Britain were to leave the EU, the British government would lose the ability to call on France to stop the refugees from trying to make their way across the Channel. "We are carrying out our orders so that the migrants leave the camp and we will continue this work this morning... so that the destruction work can continue calmly and that the migrants are not under pressure from the No Borders activists," said local authority head Fabienne Buccio on Monday. They try to climb on to lorries boarding ferries for Britain, which they are drawn to by family or community ties, because of a shared language, or because they think they have a greater chance of finding work there.